Fitting a saddle properly is key to the health of your horse. Owning a horse necessarily means also being familiar with the equipment associated with it. From bridles and bits to stirrups and saddles, any horse owner concerned about horse care needs to know how to properly fit and use his or her gear. This is particularly the case when it comes to the latter option, a recently released paper shows. Concerned about how saddle fit can affect equine health – and the health of the human rider – the British Equine Veterinary Association has published a handy guide by two master saddlers that gives readers the skinny on saddling. 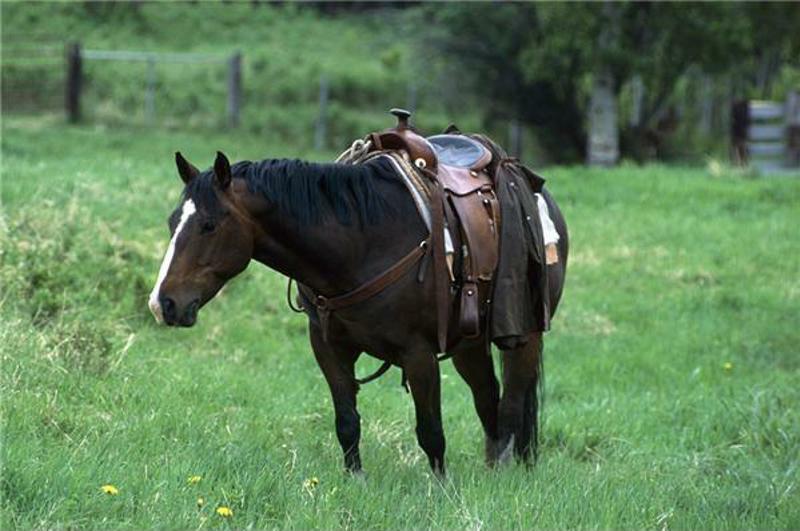 An improperly fitted saddle can hurt both the horse and the rider. Appropriately titled “Saddle fitting, recognizing an ill-fitting saddle and the consequences of an ill-fitting saddle to the horse and rider,” the paper was published following vigorous discussions that took place at the Saddle Research Trust Second International Research Workshop. While aimed at vets, the detail and illustrations make this a must-read for anyone wanting to get the most from his or her horse – especially as the paper is completely free to the public until April 2016. As the paper points out, an improperly fitted saddle can be damaging to both horse and rider. For the horse, what starts as soreness can, in the long term, turn into muscle atrophy, inhibit the development of back muscles and lead to fibrosis. The horse might see its step length fall as well as lose the ability to bend, among other things – not good whether it’s a race or show horse. The rider won’t escape the consequences either. A stiffened thoracolumbar region in the horse can lead to back pain, while an ill-fitting saddle might leave the rider with hip or groin injuries. In either case, the results point to one simple conclusion: If it doesn’t fit, you must not sit. Riding on a badly fitted saddle is an easy mistake to make, which makes it all the more important to be able to recognize when you’re doing so. According to the paper, this isn’t just a quick gander at the saddle – you’ll need to inspect it on the horse with and without the rider on top, as well as have the horse carry out it’s regular tasks or movements. A saddle tree that is too far forward, long, wide or narrow. Panels not making contact with the horse’s back evenly. The saddling tipping forward too much. A saddle that is deflated in parts. There are also some more basic principles that you should be aware of. If you want to look after your horse’s health, then make sure the saddle is central on the horse’s back at all times, and does not slip to any one side. Hallmarks of a properly fitted saddle are flat hair on the horse’s back and even sweat underneath the saddle. The rider should be able to notice inconsistencies as well – she or he shouldn’t be tipping in any particular direction, nor should his or her legs be drifting backward or forward. A good way to test the effectiveness of the saddle is to stand up with the feet in the stirrups – if the rider loses his or her balance, there’s likely something wrong. Of course, fitting a saddle properly is easier said than done. Fortunately, there are a number of professional associations that can provide advice and training for saddle fitting. In the U.S., many states have certified saddle fitters as listed by the Master Saddlers Association, including Illinois and New York. For its part, the paper recommends riders take a training course from Saddlefit 4 Life or even talk to a physiotherapist who specializes in the area. At the end of the day, your horse will thank you – and so will future you.